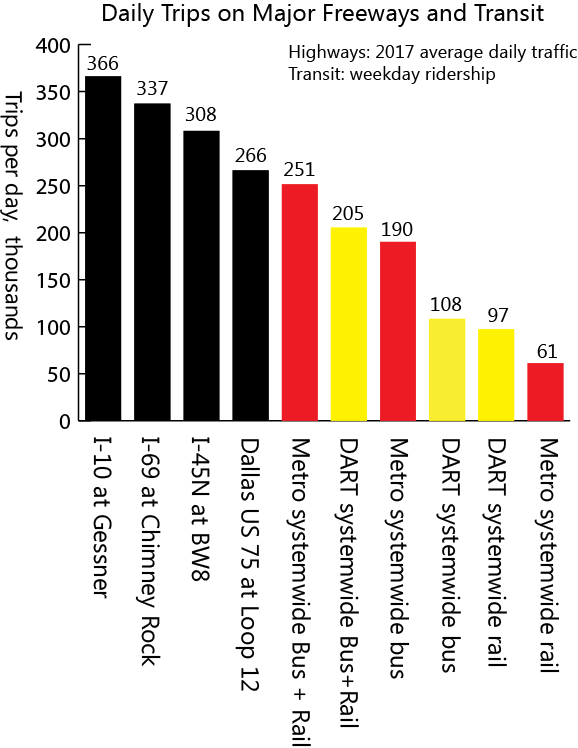 The Dallas Area Rapid Transit (DART) 93-mile light rail system has the most track length of any light rail system in the United States, although several cities have more rail track length when heavy rail is included. But despite its broad reach, DART light rail suffers from low ridership. Let’s take a closer look at DART, and see how the same pattern of DART's low ridership is occurring in Houston with recent and proposed additions to Metro’s light rail. Data is from Metro's ridership page and MetroNext plan summary, and DART's annual reference books (2018, 2017, 2016). As a reminder, ridership is so-called unlinked trips, so ridership of 1000 roughly represents 500 people making a round-trip. DART has 4.2 times the track of Metro, but its systemwide ridership is only 59% more than MetroRail. However, Houston's good showing in this comparison is due to the high ridership on the original Red Line from UH-Downtown to Fannin South. Recent additions in 2013 and 2014 costing $2.13 billion have ridership comparable to DART. DART published an extensive report on its ridership in January 2018. This view taken from the report shows that light rail ridership has been flat around 97,000 since 2013, in spite of strong economic and population growth in North Texas. The report discusses many factors influencing transit ridership, without citing a leading factor or factors. 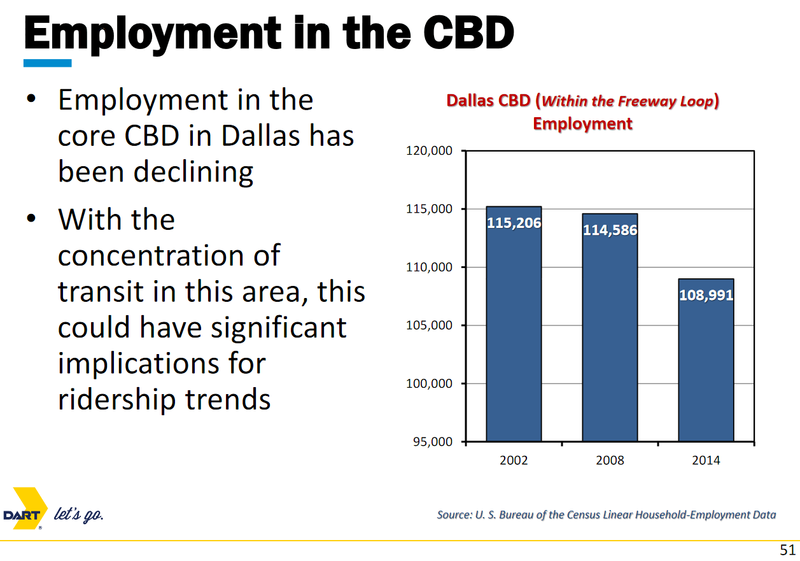 But one interesting page in the report shows downtown Dallas employment down 9% since 2002. 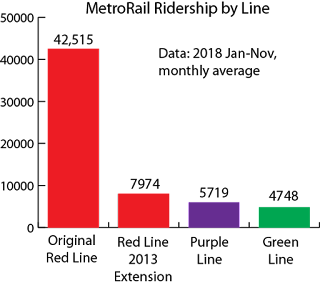 The 93-mile DART light rail system is fully focused on downtown, yet its presence was not enough to stem employment decline. It is almost entirely downtown-focused, and downtown Dallas has been in decline. 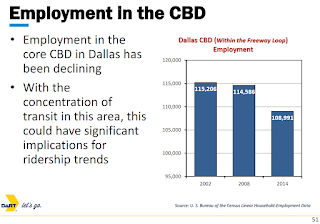 Employment in North Texas is highly decentralized, and becoming more decentralized. Many lines were built for political reasons. Tax-paying suburban communities feel entitled to get their train links, even if the links make no sense based on cost and ridership. Let's take a look at the riders per mile of track. The DART system average 1045 riders per mile of track. The most recent additions to MetroRail average only slightly better, 1226 riders per mile of track, even though the MetroRail expansion was in dense urban area (while much of DART track is in low density areas). 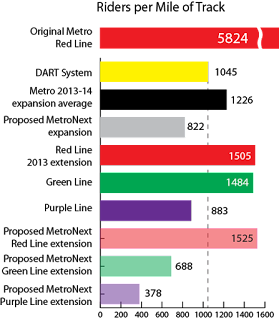 The proposed MetroNext light rail expansion averages well below DART with 822 riders per mile of track, and the proposed Purple Line extension has a dismal 378 riders per mile of track. DART opened its Orange Line connection to DFW Airport in August 2014. DFW is the fourth busiest airport in the U.S. Hobby served 20% as many passengers as DFW in 2017. 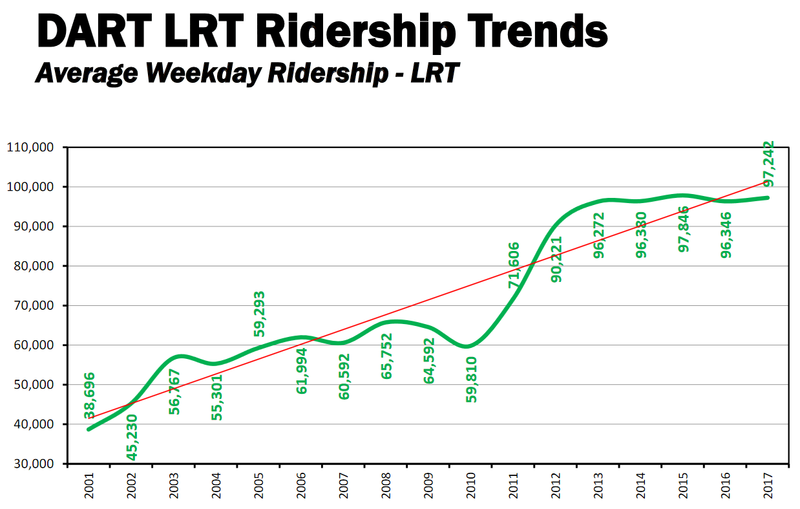 Ridership has been flat in the range of 900-1000 per day since it opened. With the current schedule showing 72 train departures per day, this averages 14 riders per train. Obviously, bus service can easily handle that level of ridership, even accounting for peak periods (which should be minimal for airport service). If ridership on the proposed Hobby light rail is comparable to DFW and directly proportional to airport size, that translates to around 200 riders per day. But other factors (e.g. shorter trip time) would likely raise it above 200, but still be in a range well-suited for bus service. 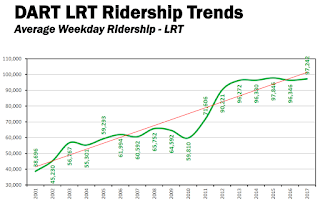 Light rail airport connections are generally ridership losers, as Tory mentioned in his recent Houston Chronicle op-ed. After all, who wants to take luggage on public transit and travel at a speed of 13 mph when most people have much better options (i.e. family, friends, Uber/Lift, company expense account for taxi, company-paid rental car). Airport workers in low-paying jobs, mainly restaurants, are the best candidates for using airport transit, and would be just as well if not better served by bus or BRT service. 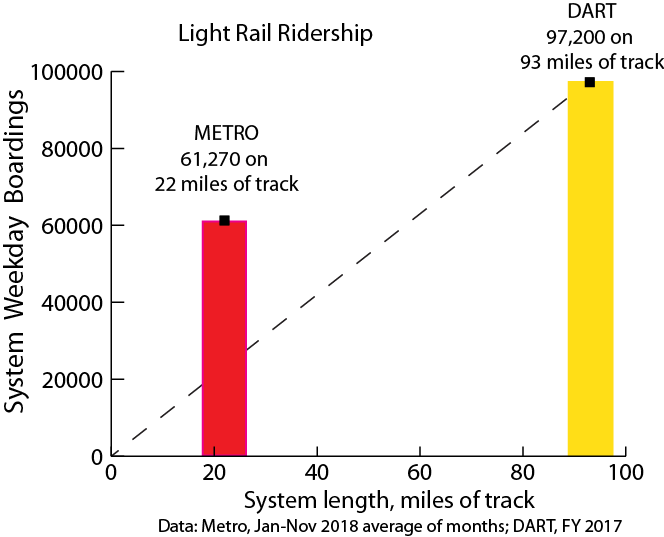 Trips on a single point of major freeways easily exceeds the systemwide overall trips (bus and rail) of Metro and DART, and busy freeways dwarf light rail ridership. The original Red Line is the only corridor in Houston which can justify light rail. Metro's 2013-14 expansion brought small increments of ridership for the high $2.13 billion cost, with ridership levels very similar to the Dallas system. The proposed $2.45 billion MetroNext light rail extensions have estimated average ridership worse than Dallas, with the Green and Purple line expansions to Hobby Airport particularly poor. There is no way Metro can justify the inclusion of the $881 million Purple Line extension to Hobby airport, especially considering that it duplicates the already-weak Green Line extension to Hobby and has estimated ridership of only 378 riders per mile of track. Transit investments should be right-sized for the service demand. This means that $150+ million/mile light rail should not be built when the demand is far lower than the capacity provided by light rail, and bus rapid transit around $50 million/mile is the correct solution. In MetroNext, light rail should be trimmed back so we don't follow too far in the footsteps of Dallas, with its large-mileage, low-ridership system. I've ridden the airport extension in Dallas and it had a lot more than 14 riders. Maybe 14 riders per car would be more accurate. Looking at the schedule, it is likely that all the early morning and late night departures have low ridership and pull the average down. Why have trains departing at all at these times? Probably because other parts of the route get higher ridership (people commuting to work in Irving or Parkland or downtown). The route may begin at the airport, but it serves other nodes besides the airport. As far as the low ridership on Houston's expansion lines, this is of course because the high ridership portions of Metro's 2003 plan were prevented from being built, despite the fact that they were authorized in a city-wide referendum. Something connecting downtown to Greenway and the Galleria would probably be just as heavily travelled as downtown to Med Center and Reliant Park.